Standard Racks, Main Amplifier Racks. Our main amplifier racks are all based around the same design. 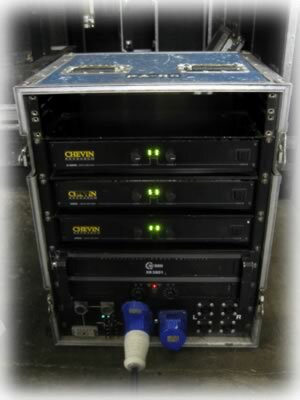 Our front of house speaker systems run 4 ways (sub, lo-mid, hi-mid and top) and so our amp racks do as well. All of our main amp racks use a C-Audio SR3801 as a sub amp, not the lightest of amplifiers but able to deliver the power required. The remaining amplifiers are split between Chevin Research and C-Audio Pulse both equally reliable. As a general rule each rack will drive 4 hi-mid speakers and 2 subs. They can drive more (the 3801 will happily run 4 subs at 2 ohms) but in our experience better quality and reliability is achieved by adding another amp rack instead of working one to its limits. Each rack has space for crossovers if required and so can become part of a relatively compact system just requiring a left and right feed. All inputs are on multipin connectors and amp racks can easily be chained together using multipin cables.